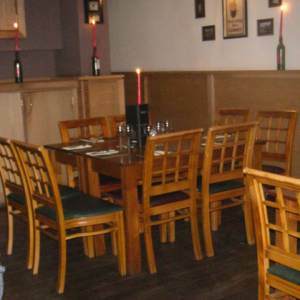 Bistro at Harry's Bar & Bistro01970 612647work BistroJoin us at Harry's Bar & Bistro and enjoy the relaxed atmosphere, occasional live music and delicious food. Come for a quiet drink in our bar or partying the weekend away. Harry’s Bar caters for guests of all ages, and provides entertainment to suit everyone. Evening meals available 5pm - 9 pm daily and lunch served Saturday & Sunday only. The emphasis is on craic in the popular Harry’s Bar, where traditional Irish and Welsh themes combined with subtle modern comforts makes the perfect entertainment venue. There is Live Entertainment occasionally through the summer and winter months. You will find a great mix of guests in the Harry’s Bar where local residents make for a friendly, welcoming atmosophere. Join us at Harry's Bar & Bistro and enjoy the relaxed atmosphere, occasional live music and delicious food. Come for a quiet drink in our bar or partying the weekend away. Harry’s Bar caters for guests of all ages, and provides entertainment to suit everyone. Evening meals available 5pm - 9 pm daily and lunch served Saturday & Sunday only. Harry’s Bistro is the ideal location in Aberystwyth to hold your special occasion let it be a birthday celebration, anniversary or your little one’s communion, confirmation or christenings. You can design a menu to suit your tastes, needs and budget.